LE CENTRE DES ARCHIVES CONTEMPORAINES. Those who were based at Guynemer will recall the building opposite the camp gates. 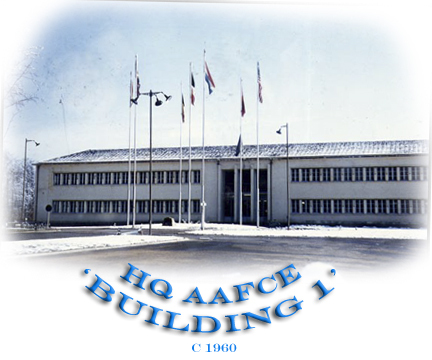 The headquarters of AAFCE, known as “Building 1”, & for many of us our place of work. Today the refurbished site is home to the French Centre of Contemporary Archives (CAC), & the road in front leading to Avon renamed as the Rue des Archives. If you have had any dealings with French bureaucracy you will be aware of their passion of producing a mountain of paperwork. Even with access to computer technology the need to create a new “dossier” seems paramount. Duplicate, triplicate and here is another form are popular words ! The constant need to renew out-of-date documentation ensures steady employment for an army of Civil Servants…………. When the storage space at the National Archives in Paris reached saturation point, the decision was made to de-centralise, & specialised centres were opened across France. The role of the Direction des Archives ( responsible to the Minister of Culture ) is to maintain the archived documents, ancient, modern or contemporary of governmental ministries & offices & to assure access. At Fontainebleau data from various sources are stored with the exception of matters pertaining to Foreign Affairs, Finance or Defence. While visiting the site during one of our FVA trips & locating the room where I once worked, I thumbed through an eighty year old medical file before being admonished by an irate official ! Opened in 1969 in the old NATO building, the service moved to new premises on- site in 1978. The first stage in an ambitious project to progressively create ten units each capable of storing 80 linear kilometres of data ! Fifty people are employed in the complex. A technical service assures the security & smooth running of the site. Goods Inwards processes receipt & storage of some 7 to 10 linear kilometres of data per year, while ensuring a coherent policy of sampling & elimination. Computer teams process & analyse all data using the latest archival techniques, as well as a Photographic Section producing around 10 kilometres of microfilm annually & maintaining audiovisual data storage. The Information Service replies to more than 15,000 questions & requests for documents annually. Archives held by CAC will be of significant importance to historians as a record of current times. Laws provide public access to archives after a delay period of 30 years, with some notable exceptions. 150 years for medical files & 120 years for personnel information. 100 years for state civil, judicial & enquiry statistics & 60 years for files pertaining to private lives or matters concerning state security or defence. Exception to rules may be made by the Minister of Culture, & consultation or research approved subject to strict legal conditions.